The Marine Megafauna Foundation – SE Asia was set up to study the marine life in the marine protected area of Nusa Penida because of our large population of Manta rays. Their goal is to identify potential threats and use these to formulate an effective protection and management plan for the area. All of the Lembongan Marine Association dive centres support the MMF in their work. We at Big Fish Diving feel very fortunate to have and long a mutual relationship with MMF, we have supported them from the beginning not only with data collection but with offering our facilities and collaboration. Their Marine Talks on Tuesday and Thursday evenings and documentary nights on Sundays take place in our Yoga Shack. Ask us about our PADI Divemaster programme where you can also get involved in data collection and research work for the MMF. 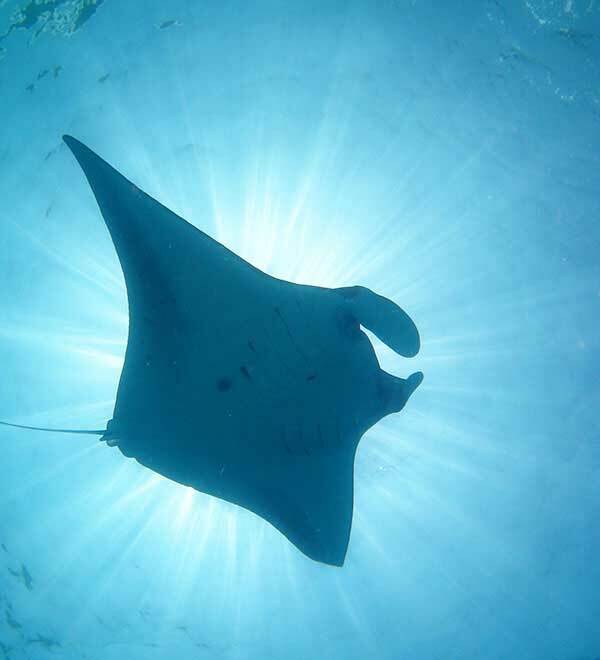 You may enjoy the show of these beautiful rays year round at Manta Point and Manta Bay on Nusa Penida. They are the largest of all rays and in some parts of the world grow to an incredible length of 670cm wing to wing. Mantas are seen at depths of up to 30m, though at Manta Point are commonly found feeding on accumulated plankton close to the surface. We have also witnessed them from the surface making spectacular leaps above the water. This might be either a method of communication; social playful behaviour; a courting display or an attempt to rid themselves of parasites. 5 pairs of gills on the underside of the body are used for breathing and Mantas interestingly have the largest brain-to-body ratio of all sharks and rays. Little is known about the reproductive cycle of these gentle giants but the gestation period is thought to be 9-12 months or longer and only 1 or 2 pups are born in each litter. Their only predators are large warm water sharks and humans who often accidentally catch them in their nets. These magnificent animals are very curious around humans and appear happy to swim with divers, however human contact rubs away the vital mucous membrane which is there to prevent lesions and skin infections. The black and white body patterns vary from individual to individual. Despite having up to 300 rows of tiny teeth, mantas are considered completely harmless to humans. Manta rays have flexible “lobes” on either side of their heads which are used to direct plankton and small fish into the mouth. They are believed to be formed during embryonic development, when a section of the pectoral fin extends away towards the mouth. The lobes are curled up when swimming to reduce drag. The diamond shaped body of the manta also aids movement in this way. The mola or ocean sunfish as it is also known is the heaviest bony fish in the world with an average weight of 1000kg and one particular Australia Mola weighing an incredible 2,235kg. Normally these fish are found in oceanic waters, however they come closer to shore from as early as July until the beginning of November in Bali. During this period you may see them at a number of dive sites around Nusa Lembongan and Nusa Penida. 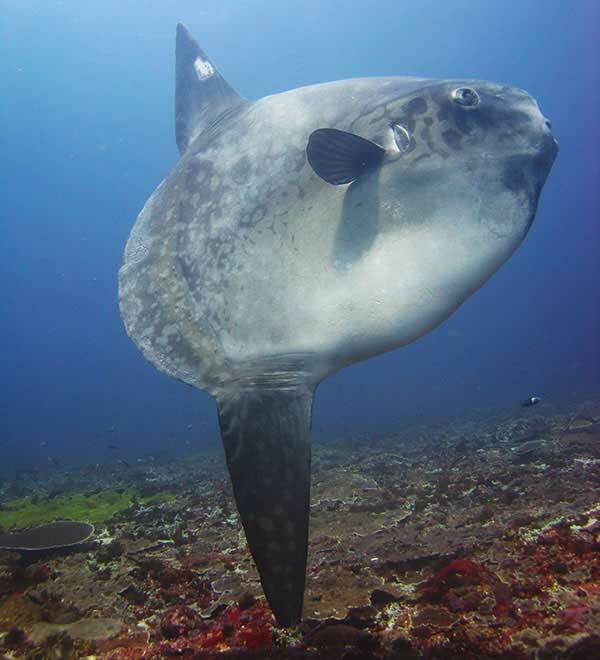 Most renowned for their eccentric shape, the mola has no caudal fin, yet displays excessively large dorsal and ventral fins. Although often sighted by our divers in shallower water, they do regularly dive to depths of 600m and beyond. The diet of a mola consists primarily of jellyfish but as this diet is nutritionally poor they have to eat alot. Also they are partial to salp, comb jellies, zooplankton, squid, crustaceans and small fish. Fortunately for them, they possess relatively few predators – sealions, orcas and sharks being their only concern. Frequently though, molas are accidentally caught in fishing nets or are harmed through encounters with floating rubbish such as plastic bags. The skin of a mola is approximately 3 inches thick. It`s colouration is believed to be for camouflage, dark above fading to a lighter colour below. The fish are well known for the impressive number of parasites found on their skin: some 40 genera of mola parasites have been recorded to date. One of the most interesting facts about the mola involves its reproductive habits. Females produce more eggs than any other known vertebrate, releasing up to 300 million eggs into the ocean at once, to be externally fertilised by the male. Have we mentioned that in the season, mola can be seen almost daily?